Australia has not needed a law against sedition [scapegoats to bolster support and quell dissent for the Coalition of the Killing's resource wars] since at least 1949, and there is no need for one now, writes Ian Barker. We are soon going to have a lot of laws telling us how to behave towards our government [your government], our constitution [your constitution] and our country [Aboriginal Land]. There is a significant difference in the proposed law of sedition when compared with the existing law. At present, we have a definition of seditious intent - for example an intention to bring the Sovereign into hatred or to excite disaffection against the government - and then we have various offences committed with that intention, for example using seditious words with the intention of creating public disorder. So, to commit an offence, one had to do one of the things proscribed and, at the same time, have a seditious intent. That will no longer be the case. The definition of seditious intent is now limited to the seditious intent which may be a mark of an unlawful association. The new offences of sedition do not require proof of a seditious intention. They can be committed by mere recklessness, and they carry a penalty of seven years' imprisonment. Sedition traditionally occupies the ground somewhere between treason, which is actually killing the Sovereign, or her heir apparent, or the Queen consort, the governor-general or prime minister, or actually levying war against the Sovereign on the one hand and lawful criticisms on the other. It started life as a common law misdemeanour, as a criminal libel. So, while not actually killing the Queen, it is seditious to bring the Sovereign into hatred of contempt or to urge disaffection, which I think means urging people to be disloyal, to the constitution, or government or either house of Parliament. It consists in mere words. For example, urging disaffection against the government seems to be what many ordinary people often do, born of sheer frustration. Problems in prosecution are legion, which probably accounts for the small number of prosecutions for sedition in Australia. 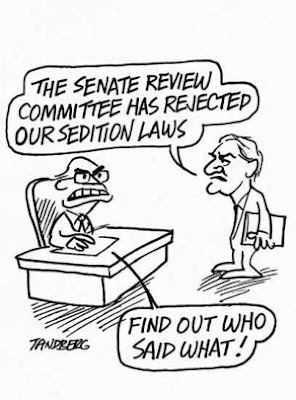 So far as I am aware, the last trial for sedition in Australia was in 1949. And where do you draw the line? Insulting the cricket team, or the memory of Phar Lap, or the principles found in the Koran, might well have the potential to cause serious trouble in the realm. Who knows? The answer does not have to await a riot, it is to be somehow derived from the words themselves. Treason is found in the criminal code. It gives pride of place to the death of the [ruling class] Sovereign, the heir apparent, the consort, the governor-general or the prime minister. Killing the leader of the opposition or the attorney-general is not treason, merely murder. Ian Barker QC: We have not needed a law of sedition at least since 1949, and probably never, for all it achieved. We do not need it now. By Ritalin Valiumnumb Bracks, Beattie oppose new sedition law Monday Nov 14 09:13 AEST Victorian Premier Steve Bracks says the Howard government's proposed changes to the law of sedition are too broad and threaten free speech. "be alarmed about Australia's new sedition laws"